This story was submitted to the People’s War site and has been added to the site with the author’s permission. The author fully understands the site’s terms and conditions. My experience as a Bevin Boy in Mountfield near Robertsbridge, SussexI was a Bevin Boy during the Second World War. I was called up for the services in 1942 and I passed my medical A.1. I was put in the Kings Royal Rifles but a week later I was told I would be in the Royal Tank Corp. Later still I was told to report to the local labour exchange, which I did, and there I was told to report to the Gypsum Mines the following Monday morning. That was how I became a Bevin Boy, named after the minister of labour at the time. On my first morning I caught the bus at 5.30 a.m. and was down the pit at 7.00 a.m. I did not get home until 7.00 p.m. Gypsum mining is like coal mining except you get covered in white instead of black dust. The shaft went down to about 500 feet and at times I had to walk for at least 20 minutes to the face where I was to work. I did not see daylight until the weekend during the winter months. Gypsum was, I understood, very good for putting out fires but one day when we had to hold a practise fire drill, as the water hoses were run out and the water was turned on, we found that the hoses were so old they were full of holes and the water escaped from anywhere but the nozzle. The fire brigade were sent for from Battle and when they came up the track to the mine they could not get past the points lever so they put them over. Unfortunately, when the fire brigade left they forgot to put the points back and the next morning the train came off the rails. There were no more fire drills after that. Descending the shaft one morning the cage coming up jammed the cage going down so we had to climb from the cage onto a platform at the side of the shaft from which ladders and further platforms went down to the bottom. On stepping down a ladder it was loose and it swung out. I was leading the gang down and was the only one with a lamp alight. I dropped the lamp and hung onto the ladder. It was then completely dark and the language from the others was not complementary. One young lad panicked and we had a job to get him down. There are many other such stories to be told. Bevin Boys received no thanks from the Government, we have not been recognised and accepted by any organisation, we did not receive any medals and we have ceased to be remembered. However, a Bevin Boys Club was formed and as far as I know about 1400 members are still alive. I also understand that a medal has now been struck but we have to buy it if we want it. When we were released from the mine in 1945 we were told that as we had not been in active service we were to be called up to serve the two years of active service. In December 1943 the British Government realized that there was only three weeks supply of coal left in the country. Many of the miners had been called up for national service. The Government had not had the foresight to make mining a reserved occupation. (A reserved occupation was one which was considered so essential that those involved could not be spared for military service). The Minister for Labour, Ernest Bevin, realized that 50,000 men would be needed to work the coalfields and he devised a plan whereby some conscripts would be sent to the mines instead of military service. These ‘Bevin Boys’ were selected by the final digit of their national service registration; those ending in 0 or 9, which included my own, were to be trained as miners. I was then living in Sherborne, Berkshire. Men were conscripted at 18 but by volunteering between the ages of seventeen-and-a-half and eighteen it was possible to volunteer and have a say in which service one joined. I did this with the intention of joining the Royal Marines. Unknown to me, because of the last digit of my national service number, I had already been selected for mining duty. As I really wanted to join the Royal Marines, I tried to get out of mining on medical grounds by claiming to be acutely claustrophobic. Unfortunately, when I went to my appeal, there were 24 other ‘acute claustrophobics’ present, so this ploy did not work and I was sent to Askern Colliery for one months training. I worked in the mines for three-and-a-half years, sometimes at a depth of a thousand feet. After the war, many of the miners did not want to go down the mines again, and moved into other occupations. Therefore, we conscripts had to continue this occupation after the other services had been demobbed. However, many Bevin Boys do not wear their medals as, unlike those in military service, we were told we had to purchase ours. This story was submitted to the People’s War site by John Hughes from Three Counties Action on behalf of Ivor Brudenell. It was collected at the Bedfordshire Country Show in July 2005 and has been added to the BBC site with his permission. The author fully understands the sites terms and conditions. I came from a small Northamptonshire village of about 700 people. From childhood, I worked on a farm, as we all did. I remember steam threshing machines and horses, which were used everywhere where work had to be done or things moved. As boys, one of our jobs was to lead the big horses to and from their place of work. Later, I worked as a coal deliveryman before taking a job maintaining runways at the nearby USAAF base. When my wartime call up papers came in 1944, I volunteered for the RAF. But because the government needed to keep up coal production, some of us were sent down the mines instead of joining the armed services. It all depended on the last digit of the service number you were given. Two digits were chosen at random each month, so it was pure chance that decided where you went. Nothing to do with my previous work experience. 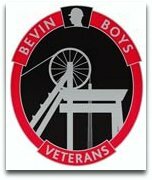 We miners were called Bevin Boys, after Ernest Bevin, the then Minister of Labour. We heard that many miners had volunteered for the services to escape from the mines. I was sent for a month’s training at Cresswell in Staffordshire, with other Bevin Boys from all walks of life. Most of this training was in a classroom. The regular miners were friendly towards us and didn’t seem to resent our working alongside them as newcomers. Pits generally had two shafts, No.1 and No.2. These provided the ventilation system for the underground workings. No.1 was an air intake and was open. No.2 was fitted with an exhaust fan and was closed. It was always very cold in No.1 and very hot in No.2. There were three shifts, 6-2, 2-10 and 10-6. Production was kept going round the clock. There were no facilities underground. You’d to take your own water and food — usually cheese sandwiches. We were given no special favours. Quite the opposite, in fact. Whereas service personnel were provided with uniforms and were given travel warrants for journeys home on leave, we had none of that. We had to pay for and obtain our own clothes and coalmining was very hard on clothing, especially boots and kneepads. Pit clothes were taken home for a weekly wash. But it was so hot sometimes that you worked in very little clothing where possible. The most important items were boots, leather knee pads and the pressed cardboard helmets we all had to have. The one benefit we did have was three half ton deliveries of coal a year. This was very welcome at a time when coal was hard to get and heating, cooking and hot water depended on having it. After training, I’d been sent to Gedling pit, near Nottingham. I lodged with a local family whose son was away in India. Their other son had become a mate of mine during training. It was possible to get weekend or leave passes on application. My job was maintenance of the electric coal cutting equipment and the conveyor belts that took the coal and waste rock away to be lifted to the surface in rail tubs. One of the toughest jobs was to bring the electric transformer along as the coal cutter moved forward through the coal seam. This involved manhandling the heavy equipment from its niche in the tunnel side on to rails so that the pit pony could pull it towards its new position, where it had to be manhandled into place and a new cable connected to it. The coiled cable had to be straightened out. It was thick as a man’s arm and covered with tarry grease and chalky powder and it was hard to clean up after that job. We had pit head showers. You’d have put your ordinary clothes on a rack and hoisted them up to the ceiling to await your return. Conditions underground were not comfortable. We had headroom in the main roads made of arched steel beams, but elsewhere, working space was very cramped. There was electric light at important junctions, but much of the time, we depended on our helmet lamps or hand held safety lamps. I’ve got a lamp as a memento. I’ve still got my numbered disc. This was an important item because these discs were kept in the lamp room on the surface while we were underground. So the mine always knew who was underground and who was not, if there was an accident. When on the surface, you kept your disc with you at all times. My number was 976. Because of my job, I also had an electric maintenance lamp. We would sometimes travel along the coal face on the conveyor belts or ride between the coal tubs on their way to the foot of the main shaft.. This was against the rules and is still forbidden now. Rules against smoking underground were also very strict as there was a high risk of gas explosion. Mining was always dangerous work and wartime was no exception. I knew of a lad who was killed on his very first day down the pit. We had a roof fall one day. I was inspecting the machines with a new lad and it became hotter than usual. When I went back to see why, I saw that the canvas pipe that brought fresh air had gone flat. We were cut off by fallen rock, but the disc system meant that our mates knew where we were. We dug with our screwdrivers and spanners and they were digging with shovels from the other side, but it was five hours before we met and we were free. The new lad panicked a bit but we got through. I was demobilised on 30 July 1948, long after the end of the war Again, unlike the services, we were given no gratuity, no demob suit, no rail warrant for the journey home, nothing. As my wife was from Lancashire, I went to work in a cotton mill in Bury. I only recently got to hear of the Bevin Boys’ Association and was glad that we were being given some recognition at last. We had done a valuable job for the country but had no campaign medal to mark that fact. Only recently were National Service and General Service medals awarded. Nor was compensation available for those whose health was permanently affected by coal dust as the national scheme did not come into effect until 1949, after the Bevin Boys had been disbanded.